Arms-deal middleman Fana Hlongwane financed a R4-million home for General Siphiwe Nyanda (left), the president's new parliamentary counsellor, when Nyanda prepared to step down as defence force chief five years ago. Hlongwane's generosity towards Nyanda may represent the first evidence of a senior decision-maker in the controversial arms deal benefiting from the R1-billion-plus in "commissions" which British multinational BAE Systems spread around to grease its sale of military jets to South Africa. Nyanda participated as defence force chief in the late 1990s' arms procurement process. Hlongwane derived his wealth largely from the more than R200-million that he received from BAE as its "consultant". The availability of such evidence raises new questions about Hawks boss Anwa Dramat's recent decision to can the last two legs of his unit's arms-deal investigation, one of which focused on BAE and Hlongwane. Contacted for comment this week, Nyanda said: "You can write anything you want," before putting down the phone. Hlongwane's lawyer denied his client had passed an improper benefit to Nyanda, claiming that the transaction was "at arm's length" and that Nyanda had repaid the full amount "punctually, with interest". President Jacob Zuma axed Nyanda as his communications minister in a Cabinet reshuffle in October. But Nyanda, once chief of staff of ANC military wing Umkhonto weSizwe, is back in a position of significant trust. The Presidency announced his appointment as Zuma's parliamentary counsellor last week. 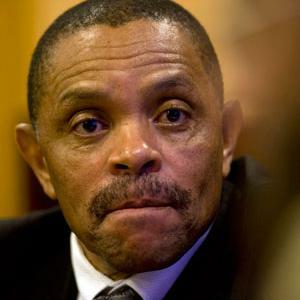 Deeds office records show that Nyanda's R3,75-million offer to purchase the home in the exclusive Johannesburg suburb of Bryanston was accepted in early January 2005, five months before Nyanda retired as defence force chief on May 31 2005. The property was transferred to him on May 5. The bond exceeded the purchase price by a large margin, which would have enabled Nyanda to cover the transfer duty, conveyancing fees and some renovations. Banks are reluctant to approve loans of more than 100% of the purchase price. This week Hlongwane's lawyer, Christo Stockenström, denied the bond constituted a "benefit" to Nyanda. "This is a complete arm's-length transaction, totally nothing untoward. It is not money that was given to him while he was head of the defence force. He had already resigned and was busy working his last month of notice and the bond was paid off before he became minister [of communications in 2009]." When it was pointed out to Stockenström that deeds records show Nyanda signed for the bond on March 2 2005 -- well before his notice month of May -- he said there had been lengthy negotiations with then-president Thabo Mbeki and then-defence minister Mosiuoa Lekota about the terms of his departure. "Initially, he thought he'd get sufficient funds and that it wouldn't be necessary to obtain funding. On short notice, he realised the defence force administration was taking a bit longer, as you might expect, and this is why he approached my client." Asked why Nyanda had not approached a bank, he said: "You know how long banks take and a bank would not necessarily give you finance to do your renovations too." Stockenström might have added that a bank would probably not have approved a home loan of that magnitude to someone about to lose his salary. And even had he still been earning his defence force salary he could not have afforded repayments, which would have exceeded R40 000 a month if stretched over the usual 20-year term. On these facts alone, Hlongwane's loan constituted a benefit to Nyanda. Without it, he could not have purchased the home. But an even more significant benefit would have been if Nyanda did not repay the full amount. Stockenström claimed the bond was repaid in full, "punctually, with interest", calculated at the market-related rate of prime minus 1%. The bond was cancelled after four years. At then-reigning interest rates and over this shorter period, the required instalments would have been well over R100 000 a month. Hlongwane has been the subject of extensive arms-deal-related investigations and legal procedures across multiple jurisdictions, tracking payments to and from him and his companies. Evidence from these, seen by the Mail & Guardian, suggests that Nyanda started repaying Ngwane Aerospace at about R70 000 a month during the second quarter of 2007. These payments appear to be consistent with the fact that Nyanda had started earning a salary a few months earlier as chief executive of Ngwane Defence, a company separate from Ngwane Aerospace but part-owned and chaired by Hlongwane. If these payments were all there were, the repayment holiday of more than 20 months in itself would have constituted a significant benefit. What is more, at the rate of R70 000 a month, he would hardly have dented the bond by the time it was cancelled. Stockenström claimed, however, that Nyanda had already started repaying in June 2005, the month after the bond was registered, with the first amount a lump sum derived from his military pay-out. He claimed there were further lump-sum payments and that he had the financial statements to prove that the loan was fully settled. He would not show them to the M&G. A noticeable feature is that Hlongwane, signing personally, agreed to cancel the bond on May 11 2009, the day that Zuma's first Cabinet was sworn in and Nyanda returned to public life as minister of communications. Stockenström denied the bond cancellation was to spare Nyanda the predicament of having to declare a benefit from Hlongwane in his parliamentary and ministerial declarations, as a bond is "an obligation, not a benefit". The timing, he claimed, was coincidental: Nyanda had paid the final instalment in about April and he, as Hlongwane's lawyer, was given an instruction on May 11 to cancel the bond. He later changed his version to say the instruction would have been before May 11. Said Stockenström: "Should there have been something untoward, why would one register a bond so it is there for all the world to see?" One explanation could lie in the argument used by investigators to attack the meticulous agreements entered into between BAE and "consultants" such as Hlongwane: they were a "sham", produced to lend a veneer of legitimacy to payments that might otherwise have attracted even greater scrutiny. When Nyanda was promoted to head the South African National Defence Force on June 1 1998, it was just in time to participate in one of the most fraught decisions of the arms deal. In May that year requests for offers had been issued to BAE Systems and two competitors for the Air Force's trainer jet requirements, with June 15 the deadline for bids. Interdepartmental teams evaluated the bids, scoring the MB339 offered by Italy's Aermacchi the highest. The results worked their way up the system to the Armament Acquisition Steering Board and the Armaments Acquisition Council (AAC) during July that year. During that time BAE's much more expensive Hawk was brought back into the running on the baffling grounds that cost was not a factor. The AAC, on which both Joe Modise, as defence minister, and Nyanda served, was the highest authority in the acquisition, bar the Cabinet itself, which confirmed BAE as the preferred bidder in November 1998. BAE and its Swedish partner Saab's joint offer of Hawk trainers and Gripen fighters was signed in December 1999 after negotiations at a cost of R15-billion-plus. Nyanda's own role in the deliberations is not apparent but his acceptance of a home loan from Fana Hlongwane, later unmasked as one of BAE's most richly rewarded "consultants", raises questions about bad judgement, conflict of interest and more. Hlongwane was shown in court affidavits by investigators from Britain's Serious Fraud Office to have received more than R200-million from BAE and perhaps Saab. The payments included amounts totalling at least R50-million which flowed from Sanip, a local company controlled by BAE and Saab, to two Hlongwane-owned companies, Hlongwane Consulting and Ngwane Aerospace. The Sanip payments were still flowing to Ngwane Aerospace at the time Hlongwane used it to grant the R4,36-million home loan to Nyanda. Stockenström, Hlongwane's lawyer, denied the payments received by his client from BAE were illicit, saying they were received "in terms of written agreements where he acted for them as a consultant". With acknowledgements to Sam Sole, Stefaans Brummer and Mail and Guardian.